We introduce a novel way to interact with sports players during the activities through actuating sports equipment. We propose ACTUATE Racket, a new type of sports racket that can change its angle of the surface. 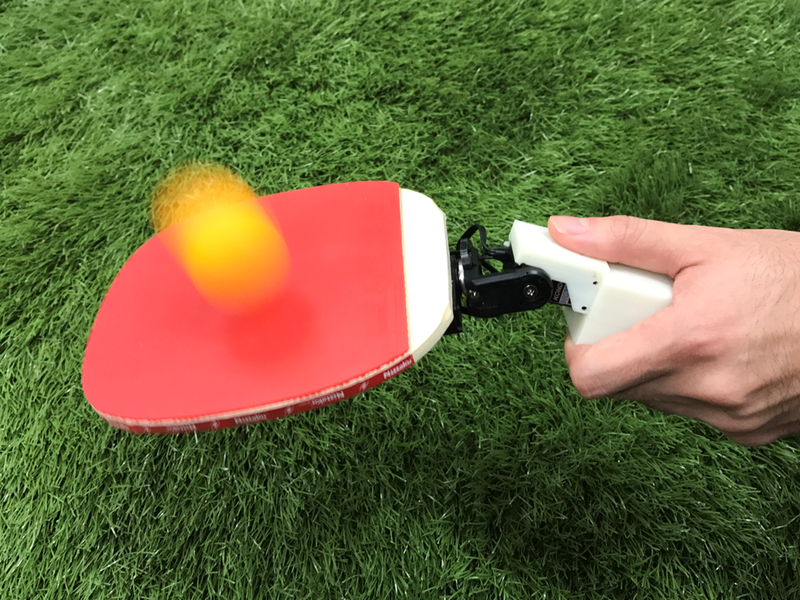 We made the table tennis racket prototype that has two servo motors for controlling the angle of its surface. The goal of this research is to explore the design opportunity of the relationships between user and racket by creating new interactions with the racket. We investigate practice methods of racket sports introductory activity: bouncing a ball on the racket rhythmically. We present three approaches with the racket. (1) One approach is to stabilize the angle of the surface during the activity. (2) Another approach is to amplify the angle of the surface regardless of the grip angle while user bounces the ball. (3) The other approach is to intentionally change the surface of the racket for each swing so that the user have to adjust the angle of its surface. We report the results and insights and we wrap up the design opportunities of the device with future scenarios.